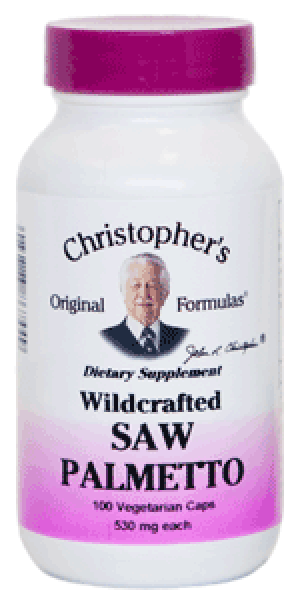 Dr. Christopher's Sw Palmetto has been traditionally been used to help treat the prostate gland, and as a male tonic. Men have also taken saw palmetto herb historically as a natural treatment for urinary symptoms associated with prostate enlargement (BPH) or benign prostatic hyperplasia. Description: Saw Palmetto has been traditionally been used to help treat the prostate gland, and as a male tonic. Men have also taken saw palmetto herb historically as a natural treatment for urinary symptoms associated with prostate enlargement (BPH) or benign prostatic hyperplasia. Throughout the world today, saw palmetto has become the herb of choice for prostate disorders. Saw palmetto has been used to help reduce the amount of dihydrotesterone, which is active testosterone found locally in the prostate. Many believe that saw palmetto helps make infertile males fertile and also increases the breast size in women. Directions: As a dietary supplement take 2 capsules before each meal with 12 oz of water or as prescribed by your health care professional. Sabal fructus, saw palmetto berry. Saw palmetto berry consists of the ripe, dried fruit of Serenoa repens (Bartram) Small (syn.Sabal serrulata (Michaux) Nuttall ex Schultes) [Fam. Arecaceae], as well as its preparations in effective dosage. The drug contains fatty oil with phytosterols and polysaccharides. In rare cases, stomach problems. Comminuted herb and other galenical preparations for oral use. Note:This medication relieves only the symptoms associated with an enlarged prostate without reducing the enlargement. Please consult a physician at regular intervals.